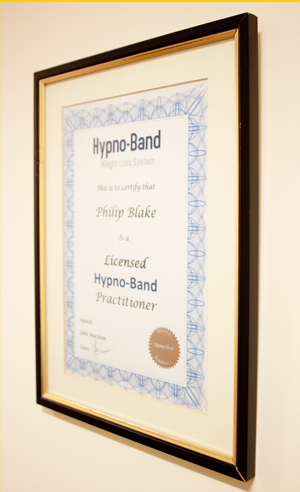 Philip is the only licenced practioner of the Hypno-Band Weight Loss System in Jersey. Philip’s most successful client, who wishes to remain anonymous, has lost over four stone stone using this method and is continuing to lose weight. The Hypnoband system is designed for those who are either clinically obese or very over weight with a body mass index (BMI) of more than 25 with no underlying emotional problems. Many people who are in this position are opting for surgery to assist their weight loss. 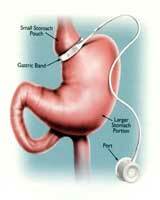 This involves the fitting of a gastric band to their stomach which effectively reduces the size of their stomach and physically limits the amount of food they can eat. Over approximately three sessions, you are taken through the process of being psychologicaly prepared for life with the virtual band as well as having a gastric band fitted – only this takes place in your mind rather than having a real operation. The aim of the system is to convince you that your stomach is smaller and that you can only eat smaller amounts of food. The Hypnoband system is a combination of visualisation, suggestion therapy and cognitive behavioural techniques to help prepare you for life with your virtual gastric band and keeping your weight off in the long term which are carried out over approximately three sessions. The first session consists of finding out some general information about your situation and attitudes to food. An initial hypnosis session takes place and a recording of the session is provided that you must listen to every day until your next session. During your second session an assessment is carried out to find out how you are progressing with the recording. If you are responding well, the ‘operation hypnosis’ session will be carried out. A third session can be taken if you need to adjust the ‘band’ should it be too restrictive or not restrictive enough. Who is suitable for the Hypnoband system? Not everyone is suitable for Hypnoband system. You will need to be either clinically obese or very overweight with a BMI of more than 25 and with no underlying emotional problems. There are several other issues that will be necessary to ensure your success, this will be explained to you at your initial free consultation. At your initial FREE initial consultation you will be assessed as to whether this is the correct approach for you to take. It might be that you will be advised to follow a different approach. Q. Does the system involve any surgery? A. No, the proceedure is entirely psychological using visualisation, hypnosis and cognitive behavioural techniques. Q. Does this system cause any pain or discomfort? Q. Is the hypnoband system safe? Q. Will the system work for me? A. The system is not magic, you must be willing to take personal responsibilty for changing your habits following the proceedure. As long as you are, this proceeure will work very well for you. You will need to be a good hypnotic subject and responsive to suggestion.